ABU DHABI: Religious leaders from the Indian subcontinent have said that the Global Conference of Human Fraternity is a big success in bringing all religions together at a single platform and that it will relay "a good message" to the world against extremism and terrorism. "Since His Holiness Pope Francis, Head of the Catholic Church, is here and Islamic scholars are also here, this will give a message to the whole world that religions do not have any link with terrorism and extremism," Allama Muhammad Tahir Ashrafi, Chairman Pakistan Ulema Council, told the Emirates News Agency, WAM, in an interview on the sidelines of the conference. He described the conference as a big success because it has brought together Muslim and Christian religious leaders from all over the world to show to the world that "we are united against extremism and terrorism." "We must open the dialogue among the religions," he added, saying that Islam is a religion of peace, love and brotherhood. Quoting a verse from the Quran's chapter 109 which reads: "To you your religion and to me mine", he added "come sit together and make efforts for mankind". 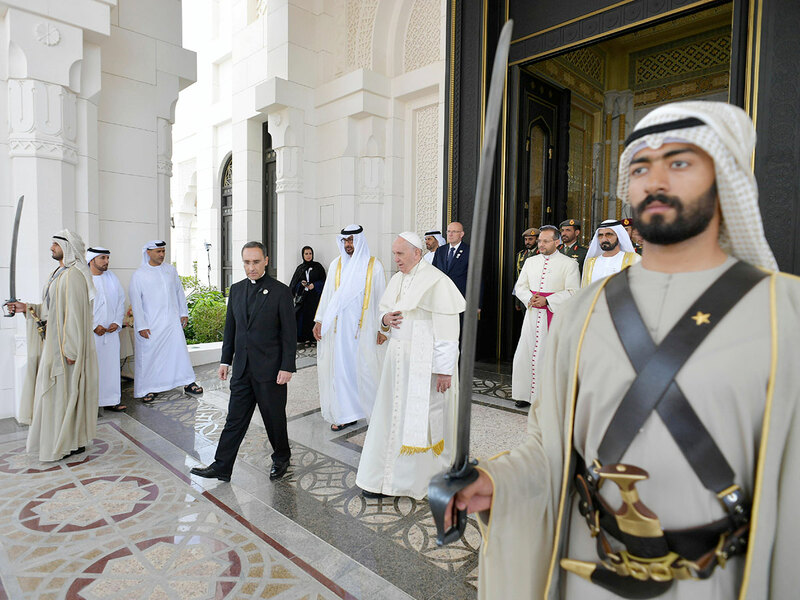 The two-day conference at Emirates Palace, has brought together more than 600 religious figures from across the world, to discuss and promote tolerance and inter-faith dialogue. "The world needs clean water, education, children are suffering from malnutrition, and there are health issues as well," Allama Ashrafi pointed out, adding "we must be united and make efforts to serve the humanity." Allama Ashrafi also spoke about the role of media in this context, saying that today it is very important that all religious leaders should come out and tell the real message, which he said is that of peaceful coexistence. He quoted an example when the Prophet Mohammad (PBUH) gave a place to Christians to worship in the Prophet's Mosque in Medina. "This," he said, "is the real message from Islam." He said that the teachings of Islam advocate a dialogue with others for the cause of humanity, describing the conference as an excellent forum for holding inter-faith dialogue. The governments in the UAE and Saudi Arabia have devoted a lot of effort to encouraging peace and dialogue, he said, as well as Egypt's Al Azhar Al Sharif and the Pakistan Ulema Council. He said that his message to the Pontiff is "come together to serve the humanity, so we relay a message to the whole world, that as a Muslim we respect all Prophets, all religious books, and holy things." Shaikh Abubakr Ahmad, General Secretary of the Muslim Scholars Organisation of India and President of the Islamic Education Board of India, told WAM that the meeting between Pope Francis and Shaikh Ahmad Al Tayeb, Grand Imam of Al Azhar Al Sharif,at the invitation of His Highness Shaikh Mohammad Bin Zayed Al Nahyan, Crown Prince of Abu Dhabi and Deputy Supreme Commander of the UAE Armed Forces, and gathering of religious leaders, would be successful and would yield positive results. He said that the conference has brought together different religions to have a dialogue and reject conflict as "confrontation does not lead to any good".